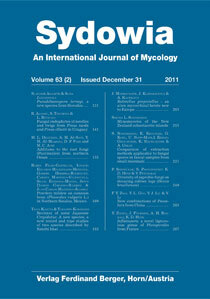 Y. Zhang, J. Fournier, A. H. Bahkali, K. D. Hyde (2011) Inflatispora, a novel lignicolous genus of Pleosporales from France. A collection of dead wood of Rhamnus alpina from the forest floor in Aude, Belcaire, Clot de la Plaine, France, led to the discovery of a new pleosporalean genus. Inflatispora pseudostromatica gen. et sp. nov., is described and illustrated and compared with genera with similar characteristics. In addition, nurDNA and RPB2 gene sequences are analyzed phylogenetically to investigate its ordinal and/or familial status. Morphologically, Inflatispora resembles species of Nodulosphaeria in having ascospores with an enlarged supramedian cell. However, it is readily distinguished from Nodulosphaeria by the presence of a thick pseudostroma above half-immersed ascomata and a sheath surrounding the whole ascospore versus the terminal ascospore appendages in species of Nodulosphaeria. Both morphological and molecular data support the inclusion of Inflatispora in Massarineae. The familial placement is, however, unclear.